The accelerated growth of Islamic finance especially in the wake of the global financial crisis, and its ever-increasing role in the mobilisation of financial resources have been a promising feature in the global financial scene. Being a manifestation of Islamic economics’ practical applications, Islamic finance cannot be developed and assessed in isolation of its impact on real activities and the fulfilment of Maqasid al-Shari’ah. Further, Islamic finance must be developed and evaluated in its totality, not confined to only Islamic banking and Islamic capital markets. Moving forward, Islamic finance must also embrace Industry 4.0 for it to remain robust in the digital age. 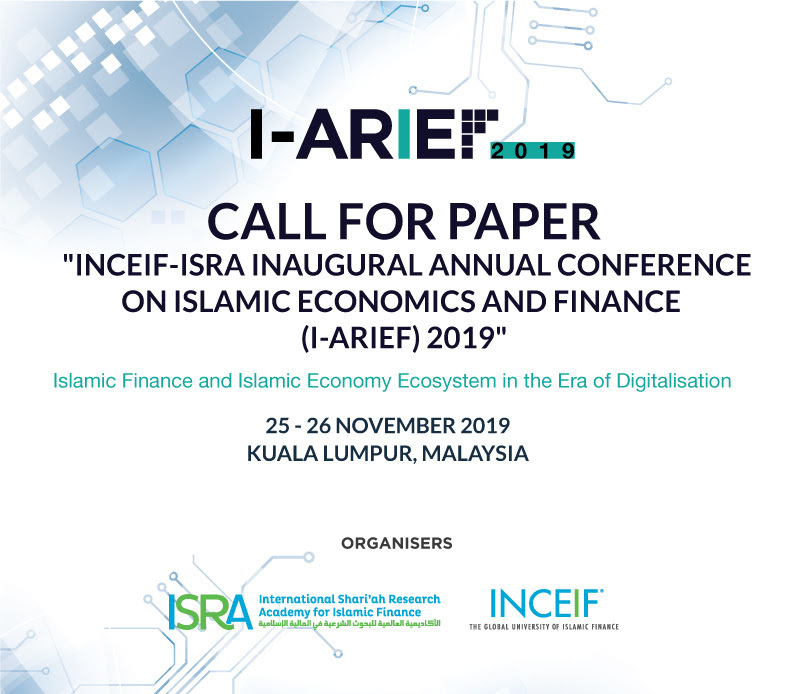 The INCEIF-ISRA inaugural Annual Conference on Islamic Economics and Finance (I-ARIEF) provides a forum for the deliberation of contemporary and emerging issues in Islamic economics and finance with the theme: Islamic Finance and Islamic Economy Ecosystem in the Era of Digitalisation. Addressing contemporary and emerging issues faced by Islamic economy and Islamic finance. Evaluating the roles of Islamic finance in a wider context, in its contributions to financial stability as well as to the overall Islamic Economy Ecosystem in cognisant of the fulfillment of Maqasid al-Shari’ah. Disseminating research output through reputable scholarly journals. The papers can be theoretical, empirical or case studies. Authors are invited to submit their abstracts by May 10, 2019 and full papers of the accepted abstracts by 30 September, 2019. You are kindly invited to submit abstracts of your research at https://www.inceif.org/I-ARIEF/registration/register by 10 May 2019. For any inquiries kindly email to iarief_secretariat@inceif.org or contact Mr. Asmawi (ext: +603 7651 4037) or Mr. Mohd Norhisham (ext: +603 7651 4088).